This Sunday night ABC1 screens some of the stories from Tim Winton’s The Turning, boasting an all star cast including Cate Blanchett, Rose Byrne, Miranda Otto, Richard Roxburgh, Hugo Weaving, Callan Mulvey, Susie Porter. Eight of the chapters that were part of the original theatrical release will screen on ABC1. A further nine chapters will receive their television premiere on abc.net.au/arts on the same night from 11pm. All seventeen chapters will be available for viewing on abc.net.au/arts over the following 14 days together with additional exclusive content, including interviews with the project’s creator and directors and an interview with Tim Winton in which he discusses the adaptation of his novel. Following on from its record-breaking world premiere at the 2013 Melbourne International Film Festival, seven AACTA award nominations and the AACTA award for Best Lead Actress – Rose Byrne, Tim Winton’s The Turning makes its television debut on ABC1 and ABC Arts Online (abc.net.au/arts). 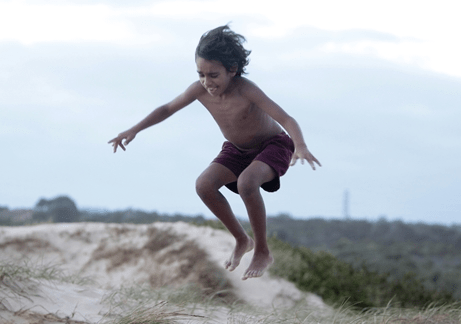 Seventeen talented Australian directors from diverse artistic disciplines each create a chapter of the hauntingly beautiful novel by multi-award winning author Tim Winton. The linking and overlapping stories explore the extraordinary turning points in ordinary people’s lives in a stunning portrait of a small coastal community. Characters face second thoughts and regret, relationships irretrievably alter, resolves are made or broken, and lives change direction forever. Stars Cate Blanchett, Rose Byrne, Miranda Otto, Richard Roxburgh, Hugo Weaving, Callan Mulvey, Susie Porter, Harrison Gilbertson, Brenna Harding, Matt Nable, Wayne Blair, Robyn Nevin, Dan Wyllie. 9:30pm Sunday February 23 ABC1. I agree with everyone. Why not part 2 on ABC1 or ABC2 the next week? Because not everyone has great or even good internet. I’m not personally upset however. I’ll just admit the last time I tried iView was a complete nightmare. So I gave up the idea. I think that’s the real reality out in the real world. Of course it is only television and it isn’t as if they have emergency warnings based on the internet and mobile phones. Rather than sirens that can wake people up as well as work when the communication system is down or the usual unreliable. So only a minor problem. I wonder how many people it excludes? 80%? Rake followed by this, looks like an excellent Sunday night’s viewing. I also wonder why they wouldn’t just show the rest the following Sun. Thank you for advertising this. I have been looking for this show online for several months now. Really appreciate the ABC for sharing this with us. Also agree with J Bar, why not show the rest of the stories on ABC or even ABC2? Why not show the remaining stories as a part 2 rather than only online?